The film is one of the best-made efforts screened at “Weird Wednesday”, a feat largely due to Sollima’s slick direction and the brooding script. Bronson is the perfect actor to play Jeff, an aging, tired assassin of few words whose profession is subtly gnawing away at his conscience. There are long, nearly silent passages of the film that at first glance might seem to be prime spots for action music, yet their meticulousness and cool objectivity undermine any shallow excitement for which they might be mined. 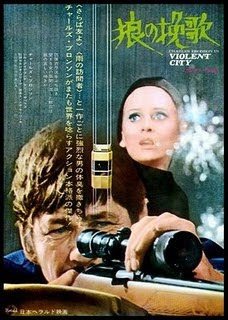 The film’s opening car chase is a prime example of this tendency. Using only car sound effects as soundtrack, the chase is not only more thrilling than pretty much anything in recent films, but it underlines the concentration it takes to maneuver a car at high velocity down narrow island roads. Later, the film observes as Jeff patiently waits for a target to circle round and round on a racetrack until he can get the perfect shot. These scenes, coupled with flashbacks of Jeff’s hesitation during a job and memories of his brief elopement with femme fatale Vanessa Shelton, sketch Jeff’s character as someone who is tired of the criminal life but can’t escape it. The finale cements this theme, where Jeff’s skills as an assassin make his final act as painful as it is inevitable. The film’s setting in New Orleans gives it ample space to fluctuate between freshly built metropolis and ancient bayou, yet another reflection of its protagonist’s disjointedness within his own world. The overall feel of the film seems oddly similar to what I’ve read about The American recently in that it is concerned with observing its protagonist without direct judgment, focusing instead on his meticulousness and detachment in lieu of obvious emotion. While the slow pace drags at times, it is by and large a benefit that allows time for the audience to draw their own conclusions about Jeff’s decisions. The great thing about the film is that, in addition to its “art” component, it is also very enjoyable on a sheer Bronson-fest level. Filmed in 70s-Vision, including the requisite amount of zooms and overexposed tropics, the aesthetic is one that I love. Whether it’s Bronson exchanging tough-guy lingo with fellow thugs or gratuitous displays of Jill Ireland’s body, all the staples of classic Italian cinema are here. If nothing else, watching Bronson frolic on a beach wearing long jeans is a singular pleasure. Telly Savalas co-stars as a rich, scheming kingpin and employs an enjoyable amount of scene chewing. Bronson’s then-wife Jill Ireland plays Vanessa. 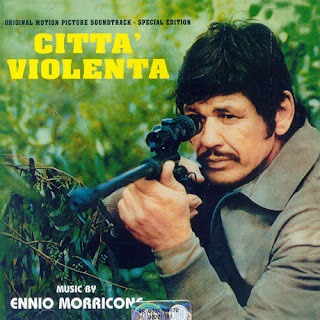 Ennio Morricone provides a rousing score. Violent City is currently available from Blue Underground.